2013 was not a particularly bumper year in PEZ acquisitions. It was not for not trying. The west coast seemed to not provide a plethora of the new issues for 2013. 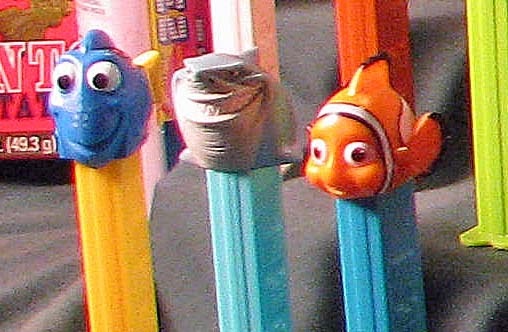 Look back through the PEZ Watch posts of 2013. There are a lot not collected as they don't seem to be in this part of the country. Since we have collectors in all time zones in the US, collectors in other regions should look for the missing 2013 issues. New MONSTERS UNIVERSITY - note the special edition SULLY which was only available from Best Buy just before Christmas, which was a lucky find. New PULL-N-GO HOT WHEELS - these actually came out in 2012 but were not obtained until this year. MISSOURI FOOTBALL was found on Mom & Dad's visit to Missouri a few month ago. The CUBS BASEBALL PEZ is a gift from a family friend who is a dedicated Cubs fan and Cubs items collector..